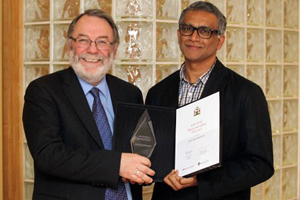 SciCom graduate Anil Ananthaswamy '00 (right) accepts the inaugural Physics Journalism Prize from Sir Peter Knight, president of the U.K. Institute of Physics. Photo courtesy of IOP/STFC. Journalist Anil Ananthaswamy, a 2000 graduate of the Science Communication Program, has received the inaugural Physics Journalism Prize from the U.K. Institute of Physics (IOP). Ananthaswamy received the award for "Hip Hip Array," a feature in the 24 March 2012 issue of New Scientist. The article (free online registration required) describes plans to build the Square Kilometre Array—the world's most ambitious radio telescope for astronomy, with dishes covering a total of one square kilometre in area. The prize, sponsored by IOP and the U.K. Science and Technology Facilities Council, is "designed to inspire the next generation of physicists by encouraging journalists to grapple with often complex topics and help spread excitement about the subject." Judges praised Ananthaswamy's story for making contemporary physics research accessible to a wide audience. "Anil Ananthaswamy has an eye for illustrative detail of which the best travel writers would be proud," commented judge Mark Henderson, former science editor at The Times (London), in an announcement about the award. Ananthaswamy is a longtime contributor and consulting editor at New Scientist, an international weekly science magazine. He is author of the acclaimed book The Edge of Physics (Houghton Mifflin, 2010), which describes his journey to visit the world's most remote and inaccessible sites for forefront cosmological research. He also works as a freelance writer for other outlets. In November 2012, he wrote the first article for Matter, a new site for long-form investigative science journalism, called "Do No Harm" (purchase required). Ananthaswamy worked as a software engineer before enrolling in the Science Communication Program. He teaches a unit on book proposal writing each spring to SciCom's graduate students. After many years of living in London, he now divides his time between Bangalore, India, and Berkeley, California.